Segovia, located in Castilla & Leon region is one of the fifteen Heritage of Mankind cities in Spain. Let us show you why this is the Capital of the Castillian Reign and the Isabel La Católica’s birth place. Starting from Madrid at 3pm, we’ll drive for around an hour to Segovia. 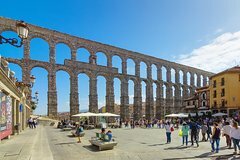 Your experience begins with the contemplation of the famous Roman Aqueduct, then a guided walking tour through the old streets will take you to the medieval age. We’ll also visit the outside of the Gothic Cathedral, Major Square, Jewish quarters and of course, the inside of the Alcazar fortress, one of the most spectacular castles in Spain, until the return time to Madrid.